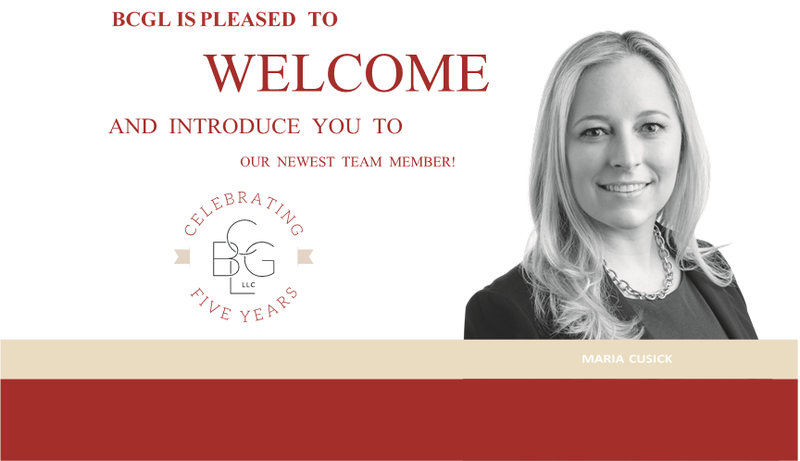 MaAs BCGL commemorates its 5th anniversary, we are excited to announce that Maria Cusick has joined the firm as an Associate in the Litigation Practice Group where she will work with Rory Connaughton, Mark Lovett and Theresa Mongiovi. Prior to joining BCGL, Ms. Cusick served as an Assistant District Attorney in Lancaster County. In that role, she successfully prosecuted cases involving white collar theft, homicide, aggravated assault, robbery, and illegal firearm and narcotics possession. She also successfully argued cases in the Superior Court of Pennsylvania. Ms. Cusick’s extensive trial and appellate experience will allow her to make an immediate impact for BCGL clients in all types of litigation matters. Cusick is licensed to practice in Pennsylvania. She earned her J.D. at Widener University School of Law and her bachelor’s degree from Columbia University. She is a member of the Lancaster Bar Association and serves the organization as a Foundation Board Member. She is also involved in the Junior League of Lancaster and active in the Community Action Partnership of Lancaster County.